Enjoy easy access to I-87 and lots of shops restaurants and entertainment when you stay at Homewood Suites by Hilton Clifton Park. Our extended-stay hotel in Clifton Park Center is only eight miles from Albany International Airport and 20 minutes by car from downtown Saratoga Springs. Local attractions including Saratoga Performing Arts Center Lake George and Saratoga Race Course can all be easily reached from our all-suite hotel in Clifton Park NY. Savor a free hot full breakfast each morning of your stay and unwind over an included evening dinner and drinks* Monday - Thursday. The 24-hour convenience mart stocks all the snacks sweet treats and alcoholic and non-alcoholic drinks you*ll need during your stay. Refresh in the heated indoor saltwater pool or energize with the very latest exercise equipment in the fitness center. Take advantage of free WiFi and professional services in the 24-hour business center. The modern 560 sq. ft. meeting room with pre-function space is ideal for training sessions and meetings for up to 30 people. Retire to your studio or one-bedroom suite featuring separate living working and sleeping areas. 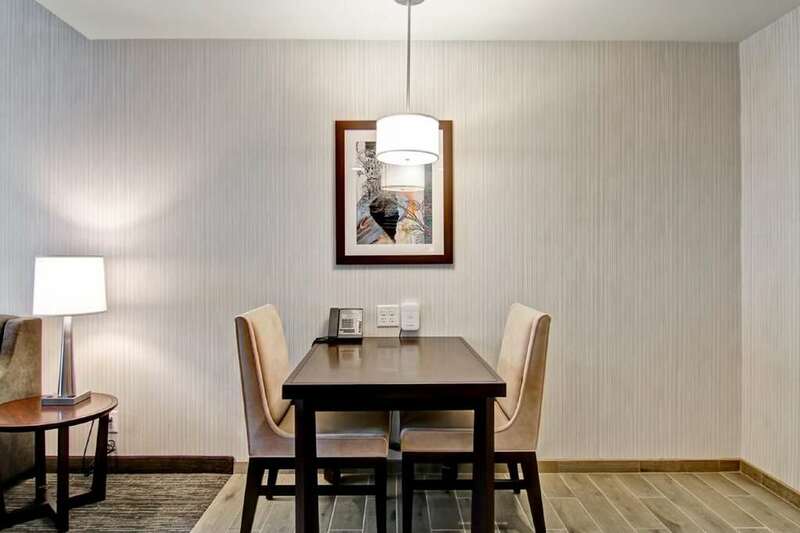 A contemporary two-bedroom-suite is also available perfect for families or longer stays. Prepare meals in the kitchen which has a full-sized refrigerator dishwasher microwave utensils and cutlery. Relax on the comfy sleeper sofa and watch your favorite HD channels on the flat-screen TV. Stay connected with complimentary WiFi at the large desk and take advantage of wireless printing to the business center. *Subject to state and local laws. Must be of legal drinking age.